Testimonials — Reynolds Roofing and Construction Inc.
Reynolds Roofing and Construction Inc.
"Dusten did an amazing job with the highest quality and workmanship. Again, we give him our highest rating and recommendation." "We are loving our roof !!! It looks fabulous and we are so happy with it." "I had a serious depression near the apex of my roof. The first pdx rains were arriving on the coming Sunday. I called Dusten explained the issue on Friday and he arrived promptly at 9.30am on Saturday. He assessed the damage and replaced the plywood and felt (30) and installed a vent. The damage was caused by trapped moisture because the previous roofer had not allowed for it. Overall, very happy with him sorting it out on his day off. The work was top notch and the price was very fair. Dusten comes highly recommended." WE WERE IN NEED OF A ROOF FOR OUR GARAGE. A VERY GOOD FRIEND RECOMMENDED REYNOLDS ROOFING AND DUSTIN. I GAVE HIM A CALL AND HE DROVE OUT THE NEXT DAY FOR AN ESTIMATE. DUSTIN IS A VERY PLEASANT YOUNG MAN. EASY TO TALK WITH AND GAVE US A VERY REASONABLE BID. HE RECOMMENDED MALARKEY ROOFING PRODUCTS. HE CAME OUT AND STARTED STRIPPING THE ROOF THE NEXT DAY. DUSTIN DIDN’T WASTE ANY TIME. SHOWED UP ON TIME. I WANT TO SAY I REALLY APPRECIATE THAT HE KEPT THE WORK SITE CLEAN. HE MANAGED TO GET THE ROOF STRIPPED BY HIMSELF AND DRYED IN WITH A HEAVY DUTY FELT BEFORE THE RAIN STARTED. 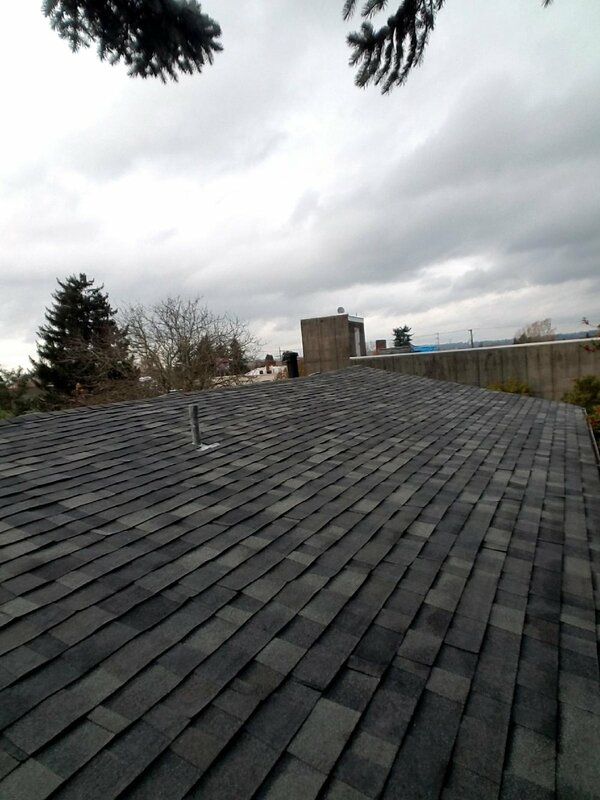 THEN HE WORKED DILIGENTLY THROUGH SOME SHOWERY DAYS AND COMPLETED A FINE LOOKING ROOF IN SHORT ORDER. SO HAPPY WITH MY ROOF! Seriously I’m happy and I’m not easy to please. I was able to pick my colors, and I was told what was going on. Both things important to me. Priced that I felt was fair and reasonable. Reynolds Roof and Construction Inc.